Career Directions, or, What Do You Have to Show for Your Efforts? In the weeks leading up to “The Humanities and Changing Conceptions of Work” Career Workshop in May of 2014 (organized and hosted by the UC Humanities Research Institute), I said to Kelly Brown that I wanted to write a blog post about the workshop for the UC Humanities Forum (which—is now defunct…so I can’t even link to it anymore). Anyway, long story short, I didn’t. Which makes this post long overdue—and though Kelly may have forgotten about it long ago, I’ve been nagged by guilt about it for nearly 10 months…But then my friend messaged me yesterday reminding me that the event was happening again this year—and I thought, “If I don’t write this post now, I never will.” And since it was kind of a life-altering workshop for me, I wanted to pay it forward by writing about it here on my own blog.First of all, I can’t thank Kelly, the other organizers, UCHRI, and the Mellon Foundation enough for having made possible the Workshop for us in Berkeley last May. (I say “us” to mean not just those who attended, but also those who, I hope, will benefit from having these kinds of events institutionalized.) The Thursday workshop was filled with thought-provoking presentations and hands-on activities, as well as opportunities to meet and have great conversations with graduate students from other campuses (as well as those from our own). And for anyone interested in seeing what took place, there are videos of the workshop available on the event site. But. But but. I had a major frustration bout last year, which is what I wanted to write about today. And it’s precisely the kind of thing that, I think, prevents really smart Ph.D.s from getting a job they want, whether it be ac or alt-ac or whatever.One of the sessions that day was a résumé workshop with San Francisco-based résumé writer Jared Redick, who runs The Résumé Studio. If you watch the video, you can tell that Jared is an incredibly smart guy: the way he organizes the presentation, the way he explains the materials, the way he responds to questions—this guy knows his stuff. And while, granted, the idea of a résumé writer might seem silly to some of us (what, you can’t write that stuff on your own? ), for a guy charging $180 an hour in a city where anything can be bought with money, we were lucky to have a workshop with him at no cost to us. Throughout the workshop many participants expressed that the practical advice he was giving us was helpful. And at one point (about an hour and 13 minutes into the video of the workshop), a participant asked the question of how we might make something like our dissertation a component in our résumé—when, in reality, a “dissertation” doesn’t really mean much to many employers. For those who want a textual summary: Jared makes, in his response to the question, a reference to a “50-page dissertation” that someone might mention in a résumé. Of course, Ph.D. students in the throes of qualifying or ABDness know that this is ridiculous. So they laugh. And when Jared reacts with humor and good nature—to diffuse the awkwardness he had created—they laugh more. But what you don’t get from the video is that the laugh emitted by the students was simultaneously one of incredulity as well as scoff. And as I sat there in the room, I identified it as one that was scoffing at Jared, the guy in the front of the room that was helping us learn how to write a good résumé. That sounds unfairly mean. And it really is true that most (non-academic) employers wouldn’t put much weight on the fact that someone completed a dissertation—or even a Ph.D. program. But that isn’t our problem. We can’t change what people know or understand; we can only work to develop and present ourselves in the best way so as to make ourselves employable (and attractively so). And let’s face it, the nature of a dissertation (even something as simple as its length) depends on the department, the discipline, even the institution. My literature dissertation is not going to look like a history dissertation. I wouldn’t even venture to compare it with an ethnic studies dissertation, or a chemical engineering dissertation…or an education dissertation from a different institution. A million dissertations, a million different things. So, how are employers outside of academia supposed to understand such nuances? We can also think of things this way: A company isn’t going to hire some random 22-year-old just because he has a piece of paper in his hand that has the letters B and A (or S) on it. The employer will want to know: What have you done in the past? What kinds of leadership positions have you held? What can you do for us? So why would the evaluation of a Ph.D. be any different? No one is going to hire us just because we have a Ph.D.—employers want to know what we’ve done, and what we can do. In other words: What have we got to show for our efforts? The point of a job search is to weed out candidates that 1) don’t have the qualifications and 2) don’t stand out. (Only after that comes the “Does this person fit in with our company culture?” hoop.) If you’re lucky, you may actually have the qualifications necessary to do (or even apply for) a particular job. But will you stand out? If the main thing you’ve got going for you is the fact that you wrote a dissertation, good luck—because you know that every other Ph.D. also has done that. That doesn’t make you stand out; that just puts you on par with everyone else. So what are we supposed to do, as Ph.D. students who will have spent 5+ years in grad school to go on the job market in our late 20s (if we’re lucky) and beyond? The answer is the same as what we might ask of the undergrads in the classes we TA. How are you doing in your classes? What are your extracurricular activities? What kinds of special projects have you done? What kinds of officer positions have you held in organizations? What kinds of work experience do you have? A strong résumé isn’t going to fill itself out while you do your coursework, TA, and write a dissertation. Presenting at conferences is great, publishing even better—but even those are more geared toward a CV, not a résumé. What are your responses to the above questions that you might pose to the undergrads? What kinds of research groups or conferences have you organized? What kinds of grants and fellowships have you received, and what have been their outcomes? What kinds of roles have you filled in student and community groups? What do you have to show for your efforts, as more than just a “researcher” or a “teacher”? Being a Ph.D. student—and earning that degree—is a lot of work. Those who recognize that, will recognize that. Those who don’t, won’t. If we’re serious about opening up the possibilities of life after grad school, then we need to be serious about the amount of effort we put into building up our résumés. And we can’t ever scoff at people for not understanding what we do—because if you’re the kind of person who scoffs about that, chances are, your résumé will be something that people will want to scoff at too. [Just so you don’t think I’m talking out of my hat, here’s a story to illustrate just how much scoffing some employers do. Once upon a time my boss and I were screening candidates for an office manager at my old job. We offered some people interviews based on their résumés, and after one of the interviews—in which the candidate had not-so-much the qualifications we needed and not-at-all the company culture we had—my boss marked the applicant’s résumé with the words “His tie was ugly” and tossed it aside. And that was that.] The goal, I think, is this: Be well-rounded. Be humble. Be yourself. Only then can we begin to make the M.A./Ph.D. work postgraduation, whether ac, alt-ac, or non-ac. This article was originally published on http://acculturationmodel.blogspot.com. Satoko Kakihara writes about literature, gender, and Japanese imperialism. 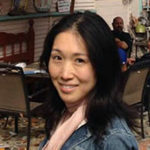 She earned her Ph.D. in Literature from UC San Diego and is currently Assistant Professor in the Japan-in-Asia Cultural Studies Program at Nagoya University, Japan. She has been sneaking her way into UCHRI-based blogs since 2011.